Bangladesh Army Civilian Posts Job Circular 2017 has been published in https://www.army.mil.bd/. Bangladesh Army Civilian Posts Job Circular various posts. Every interested Bangladeshi person can apply for this job within specific time 31st august 2017. Bangladesh Army Civilian Posts Job Circular 2017 has been given bellow. 2. Only Bangladesh Army Civilian Posts determinate application form can apply otherwise application will not accept. There are 219 posts various vacancies are applied. Educational Qualification: Please see advertisement. 1. Total Number of Post:219 posts. 2. Total Number of vacancies: Please see advertisement. Every Interest legal candidate to https://www.army.mil.bd/ or http://www.bdresultjob.com/ at download and print their application form. Only Bangladesh Army Civilian Posts determinate application form can apply otherwise application will not accept. 1. Passport size photo 4 (four) copy photo. 5. For the post 200/- pay order/bank draft and write candidate present address 10/- taka post card with envelop. Application Send Address: Please see the advertisement right side your choice post address. 1. Age on 18-30 years (31 August 2017). 2. Age on freedom fighter son/daughter- 18-32 years (31 August 2017). This Circular any update found https://www.army.mil.bd/. Tags: bangladesh army Civilian circular 2017. bangladesh army circular 2017. join bangladesh army circular 2017. www joinbangladesharmy mil bd. Civilian teletalk com bd. join Bangladesh army. bd army job circular 2017. www Civilian teletalk com bd. 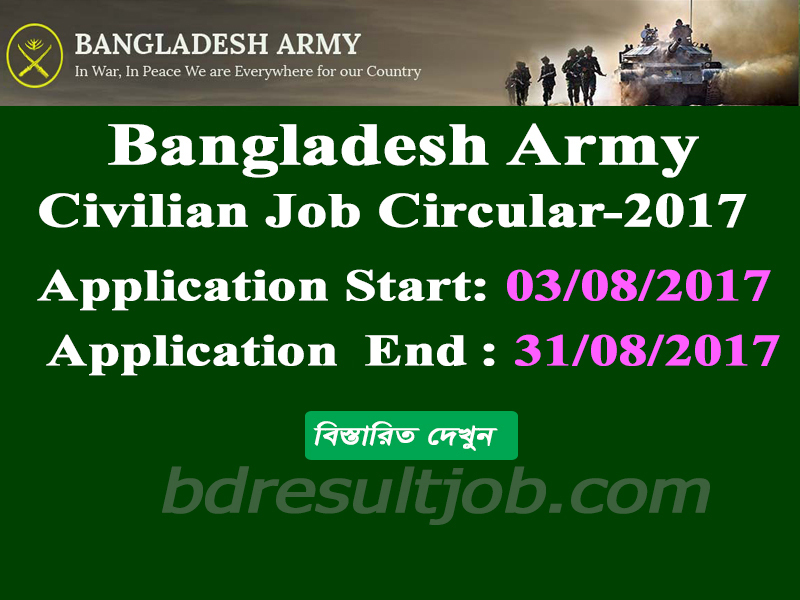 Army Circular 2017. army job circular 2017. www joinbangladesharmy mil bd 2017. Civilian circular 2017. join bd army. bangladesh army circular 2018. teletalk job circular 2017. Civilian job circular 2017. join Bangladesh army 2017. www joinbangladesharmy mil bd circular. Bangladesh Army Civilian Job Circular 2017. bd army circular 2017.